Connecting the Ideal with the Practical and building Financial Roads to reach results. We are believers and not cynical, although Our Profession relies on Professional Skepticism on Financials as one of the key ingredients it does not take away the opportunity we have to believe in and to help build a road where the Ideal and the Practical connect. Your key vision to help and to add value to Communities and Society through services meets it's delivery through Financial and other Resourced needs. We support your vision and passion to make a difference in positive ways - we can be strong partners to your vision through helping you plan with Strategic and Operational skills to cover the Logistical pathway to mapping and supporting your Non Profit. We can use Financial skills for Good on Accounting, Taxes, Financials, Financial Forecasting, Budgeting, Planning, Payrolls, Advisory, Financial Transparency, and Compliance that will ALL benefit the broader goal to help. We connect to Grant resources, Non Profit Leadership groups and other solutions that can help you get underway to your goals as also preparing to file and form your Non Profit or maintain your Non Profit with Form 990 IRS Compliance. Where your Non Profit has Grants and Employees you have needs to meet additional responsibilities where Accounting and Compliance skills support the pathway of practical compliance that protects the Ideals of your beneficial mission to bring to good. "Supporting Vision and Ideals with practical support to protect your Non Profits optimal viability as an Entity for Good functioning in Financial Compliance"
Where we also can connect with Economic and Statistical resources there is additional value we may add through insight. The Best Problem solving happens wih teamwork and we'd like to work with your team. Non Profits generally begin with a vision for some measure of socially beneficial improvement. The key starting point is having a vision. As a CPA Practice we seek to support Non Profits with Financial Expertise. We can support Non Profits on Financials, Controls, Analysis, Grants Compliance and IRS Compliance Reporting. Stay tuned as we refine this section and add more details. We can support your needs on IRS Filings related to Non Profit status and maintenance via initial filings and annual Form 990. Foundation Center - a key National Resource for Non Profits. 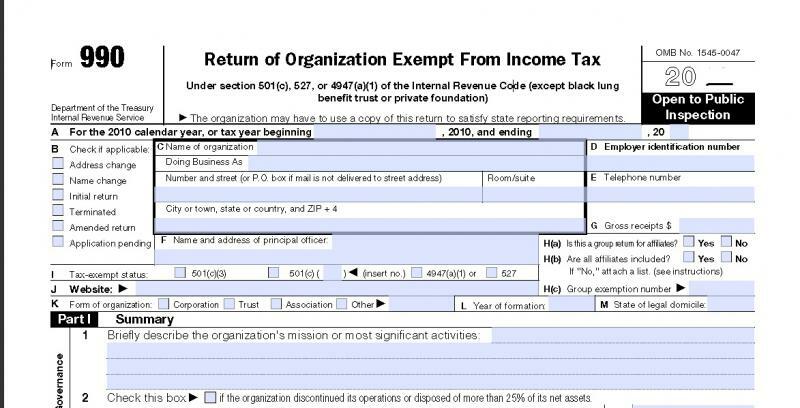 DCarsonCPA for Non Profits on IRC § 501 C Entities for IRS Form 990 / 990 Ez on Tax Compliance. As noted above call us on Form 990 / 990 ez and related IRC § 501 c Entities we can help on Tax Compliance to protect your beneficial mission and to deliver Accounting, Transparency and Strong Controls support to protect your Financials. We can also help you connect with Non Profit learning and grants. We work for the broad needs on Non Profit Financials and focus in on the relevant specifics to your needs. We are interested to support Non Profits on Financials, Accounting, Taxes (IRS Form 990, 990PF, Payroll et al), Compliance, Governance, Strong Controls and Transparency. Our position to help is on Services and with research that in the aggregate can improve your skills and connecting ability on Grants, Funding, and maintaining the Public Trust and thereby funding for your Non Profit. DCarsonCPA On Non Profits is Our daily update to the points where Financial skills can help in support of Non Profit needs. Strong Financial Maagement is a powerful skill that can help strengthen your Non Profits ability to meet it's socially beneficial goals. On Services Contact Us or e-mail info@dcarsoncpa.com. Including but not limited to: Statement of Net Assets, Statement of Financial Position, Cash Flows and Changes in Funds. Taxes fpr Payroll, Employee Benefits, and the key set up lines through 1023, on 990, 990PF and the state knes on Tax Exemption and as applicable regulatory reporting. The Attached References for Outgoing news links have been posted with the forethought that a key role in supporting Non Profits is the channeling of information to those who are in a position to help and to those who may need help. Help comes in many forms through Volunteering, through Resources of time and knowledge or through donations of Direct Funds to help assist Non Profits on Important Socially Beneficial Missions. We are comparatively new to the experience of assisting Non Profits but have direct IRS taught Familiarity with Form 990 and the approval process from the IRS to obtain and protect a Non-Profit designation under the IRC. Our roots in the Financial Sector and in General Business provide strong insight that is transferable to all Financial Decision Making needs. Skills that deal with the Accounting, Operations and Controls for Financials and the Transparent Reporting that best supports the Public Trust and desire to see you suceed at your Non Profit mission to best benefit your Social Mission that is supported by the Public with Strong Ethics and Integrity. We foresee that the opportunity to help those with a socially beneficial vision to connect with Grants and Decision Making tools in this format is of value to the Non Profit community. We have been actively researching the avenues we can support the Non Profit sector for two years now primarily in the role of acitve communicators to support the message of Non Profits through social media channels. We have every bit of intention to help where we can in the ways we can on knowledge and services that will benefit the Non Profit community at large on Financial Decision Making and in the Public Trust. We hope that these links will prove of value to your socially beneficial missions and this is just a begining of sorts for the ways we will work to share knowledge and resources over time with growth. We hope that it is understood that our goal here is to build knowledge for all. Our services exist independent of the outgoing links here that are provided only to build knowledge for interested parties; We have provided them for the better benefit of the community of Non Profits at large to share important core knowledge from Research that can help the Community of Non Profits. You can reach us at Contact Us or info@dcarsoncpa.com for inquiries, to connect, or for related services needs on Financial Decision Making Support. On a Human level with the hope to use Financial Skills to help in the Non Profit Sector. Family experiences with the Non Profit Sector including Volunteers and an Uncle who worked with Easter Seals. As well as Family members and Friends who have made significant contributions through services, knowledge and resources to support Non Profits. In my Family roots a Doctor, Nurses and a Dentist (who had helped Clients in need during the Great Depression - waiving and reducing fees to meet Client needs) and a Strong Group of Senior Family members who left us with a clear vision of how we all are called upon in our own ways with special skills to help in Our Communities. Link to DCarsonCPA on twitter and in the regional lines where we support relevant Non Profit, Government, Indutry and Individual updates that include Non Profit informational support.